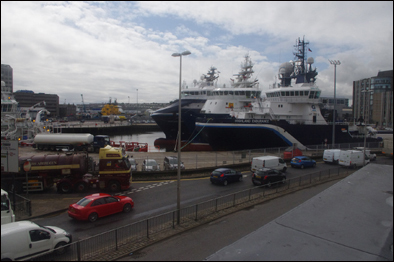 I have left Cornwall and driven almost the length of Britain and have arrived in Aberdeen. I took a leisurely drive to get here, spending the night in hotels near Birmingham and then in Ayr, which is just under 40 miles southwest of Glasgow. The roads were mostly motorways so there was not much to see on the way. I pre-booked five days at the Rosemount Palace which I found online. 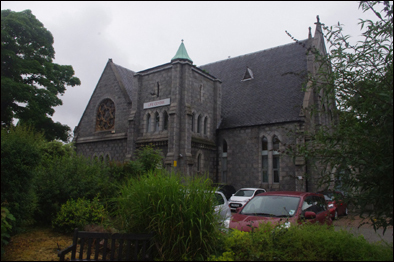 It is described as a converted church and I drove round it several times before I decided it must be the place I was heading for because it looked very much like an active place of worship. It is more of a B & B than a hotel and it seems that a service is held there every Sunday or so a sign on the courtyard wall informed me. Inside there were a few rooms set aside for meditation and counselling on the ground floor. But there were also bedrooms and mine was on the first floor via a maze of a corridor. When I awoke the following morning, which is today as I write this blog. I set off to explore the city. 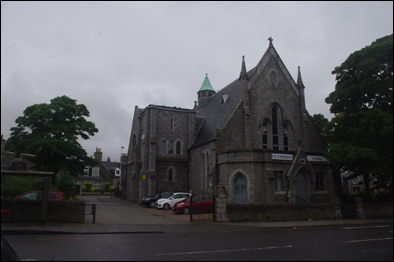 I had heard of its Granite buildings with their dormer windows before I arrived there and it was this fascinating knowledge which inspired my visit. 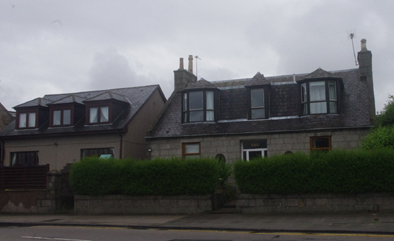 For the uninitiated, dormer windows are the ones in the roof and I had heard that Aberdeen boasts more dormer windows than any town in Britain. 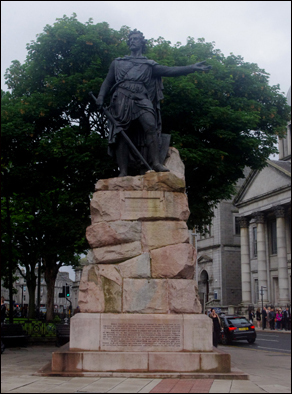 As I walked I spotted the statue of William Wallace opposite His Majesty’s Theatre. I was relieved to see that he looked nothing like Mel Gibson. His outstretched hand is pointing in the direction of the Theatre, where there were people queuing for what appeared to be a student graduation ceremony. 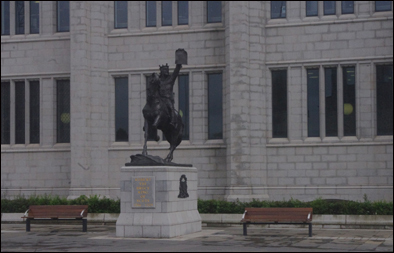 Further on I noticed a statue of another Scottish hero, Robert the Bruce, outside the former Marischal College and University buildings which are now used as the city council headquarters. The statue was placed there in recognition of what Robert the Bruce had done for the people of Aberdeen, which was chiefly setting up a charter in 1319 for the Common Good fund, which appropriately paid for the £125,000 statue. This charter is what King Robert the Bruce is holding in his left hand. 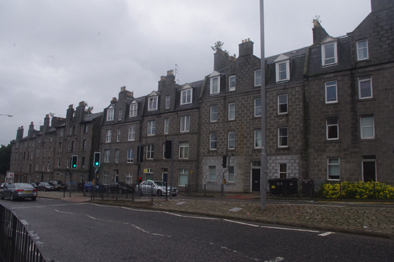 It also granted the people of Aberdeen some feudal rights over the Forest of Stocket after they sheltered him during his outlaw days. A sign pointed me in the direction of the tourist information centre where I was able to obtain, maps and guides to the city and its surrounding area all free of charge. I asked the young man who served me where I could find the harbour and docks and was told that they were only a few yards behind the very building we were standing in. Two hours later I returned to the Rosemount content that I had seen more than enough for one day and with the knowledge that there was still much more to see in this fascinating city and the surrounding area.